Chinese company Nu Skin's incentive to Dubai and Abu Dhabi from 7-17 April has involved more than 14,500 delegates. Nu Skin delegates have stayed at 40 hotels in the United Arab Emirates (UAE) – 25 hotels in Dubai and 15 hotels in Abu Dhabi. 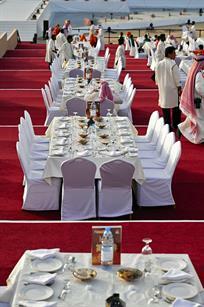 Two gala dinners for 7,500 delegates each were held over two days at Dubai’s Meydan Events Arena near Bab Al Shams. The lavish Arabian-themed banquet dinner included a fireworks display. More than 300 chefs were required to deliver the dinner, which featured more than 300 ouzie, the Arabian Gulf region’s signature slow-cooked whole lamb dish, as well as 70,000 pieces of mezza appetizers, more than 2,500kg of rice, 21,000 kebab skewers, 3,400kg of shawarma meat and 4,600kg of beef and chicken. Transport to the event, which was organised by Arabian Adventures, required nearly 140 luxury coaches, while 40 limousines for the company’s senior management and VIP guests were provided by Alpha Tours. As delegates depart the UAE over the coming days, Emirates Airlines and Dubai Airport are also facilitating the transfer of delegates back to China, Hong Kong and Taiwan. The last wave of visitors is set to depart the UAE on April 17.